Click/tap the cards to explore fun redwoods facts and learn about layers of the coast redwood and giant sequoia forests. In 1769, Don Gaspar de Portola led the first European expedition up the coast of California. 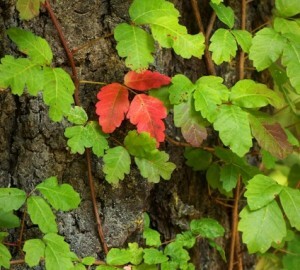 They encountered their first coast redwood at Monterey Bay, and named it Palo Colorado, or red tree, for its color. Coast redwoods can live more than 2,000 years, but ancient coast redwoods are rare—less than 5 percent of the original forest remains today. 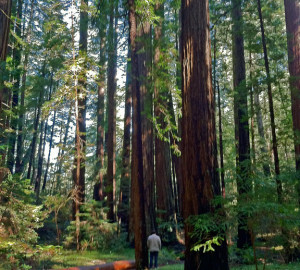 About 18 percent of the remaining coast redwood forest is protected in parks and reserves. Humboldt’s flying squirrel, named after the famed naturalist Alexander von Humboldt, is a newly discovered species found in the coast redwood range and along the Pacific Northwest. The flying squirrels have a unique anatomy that makes them perfect for cruising through the redwood canopy. They use a parachute-like membrane between their arms and legs, called their patagium, to glide from tree to tree. Leaves are green because they are packed full of a pigment called chlorophyll. This pigment absorbs the sunlight light needed for making sugar out of carbon dioxide during photosynthesis. When it absorbs light however, it only absorbs light waves that are red and blue. Chlorophyll reflects green light waves back into the atmosphere and we see green. Redwood branches provide habitat for other trees. 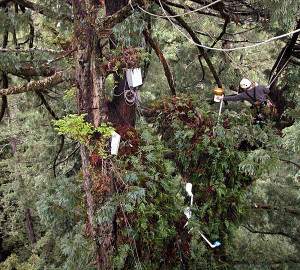 Scientists found a 40-foot-tall western hemlock growing in soil accumulated on a redwood branch hundreds of feet off the ground. Water is “pulled” to the tops of redwoods partially by cohesion, or the attraction among water molecules. Why Do We Have Tall Trees Up North? In northern Humboldt and Del Norte Counties, the redwood forests get nearly double the rainfall that the forests to the south get. When trees have more access to water, they get to keep the pores in their leaves open more often to absorb carbon dioxide (the raw material needed for photosynthesis and growth). More water means less stress and more growth and when trees grow they love to add vertical growth and get taller so that they maintain their competitive advantage over neighboring trees. Also, drier forest conditions (like in the south) lead to more frequent fires. The trees in the south can’t allocate as much energy to growing taller when they frequently get burned and need to heal after fires. 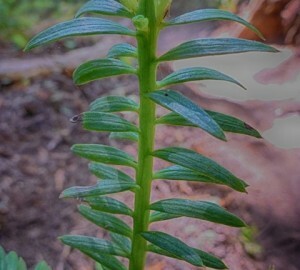 In recent years, scientists have discovered many species that live their entire lives in the coast redwood canopy, including worms, salamanders and plants such as Sitka spruce, ferns and huckleberry. Woodpeckers and other birds and bats eat insects living in the giant sequoias. 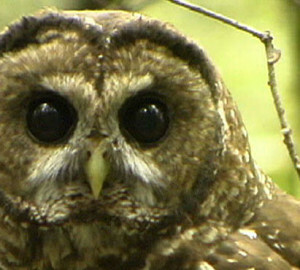 On the Green Diamond Resource Co. property in Humboldt County, spotted owls feed primarily on the dusky-footed wood rat. Owl counts are conducted by foresters using a method where a mouse crawls up a stick held in the air and the owl swoops down silently for the snack. 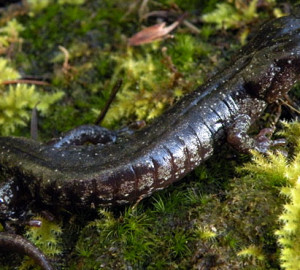 The wandering salamander (Aneides vagrans, pictured above) lives on the tops of redwood trees. David Wake, Professor of Integrative Biology at the University of California, Berkeley, named the species. Wilting Redwood Sorrel in the Coast Redwood Understory? 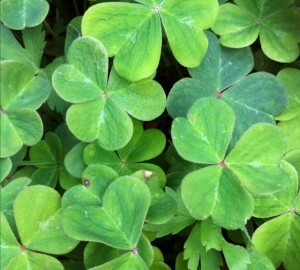 Ever wonder why redwood sorrel (Oxalis oregano) leaves appear to wilt in the sun? This herbaceous, shade-loving plant will get sunburned with prolonged exposure to the sunlight and so leaflets fold downwards as a protective response. Remarkably, the plant isn’t wilting (involuntary collapse) and is instead actively moving the leaflets, similar to how a Venus fly-trap plant closes its trap quickly to catch flies. Delicate leaves of Redwood Sorrel in the shade of the coast redwoods. Coast redwoods are monoecious, meaning that male and female reproductive parts are present on the same plant. Redwoods are conifers, which means they have cones and needle-like leaves. Mature cones in the canopy dry and shrink in low humidity, opening up their scales to expose the seeds, which are easily dislodged by the wind. A coast redwood cone is about 1 inch long and contains 14 to 24 tiny seeds about the size of a tomato seed. It would take well over 100,000 seeds to weigh a pound! A single tree may produce millions of seeds in a year. Only a small percentage of the seeds actually germinate and grow into seedlings. Redwood seeds hidden within this green cone won't join the forest seed bank because the cone fell off the tree too soon. 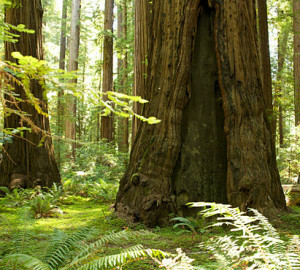 Coast redwoods grow more than 360 feet tall and have trunks up to 24 feet around near the ground. 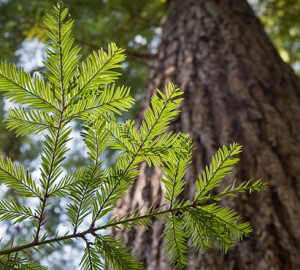 Redwood is among the fastest growing trees in the world. In good conditions, redwood seedlings grow sometimes more than a foot annually. Coast redwoods have the potential to gain most of their height at a relatively young age. 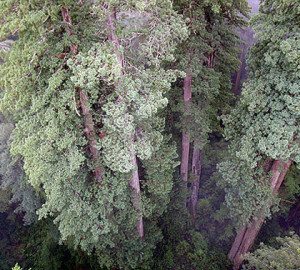 Upon reaching the canopy, a redwood’s uppermost foliage is exposed to more sunlight, wind and lower humidity, slowing the vertical growth dramatically. The marbled murrelet was first described at sea in 1789 by Johann Friedrich Gmelin, but it was not until more than 125 years later that these birds were proven to nest on land. For decades, loggers and biologists had noticed the small seabirds flying inland in the Pacific Northwest (first observation was in 1896 in Alaska) and referred to the mysterious birds as “fog larks” in reference to their distinctive bird call. 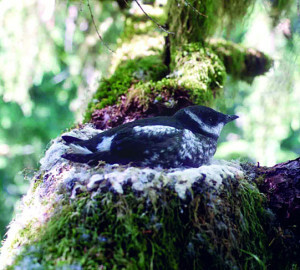 In 1918, the first marbled murrelet chicks were discovered on the forest floor in Minerva, Oregon after loggers had cut down trees in the area. In 1974, the first published account of a well-documented tree nest was a Douglas-fir at Big Basin Redwoods State Park. This observation is widely accepted and finally eliminated all doubt that marbled murrelets use old conifer trees for nesting. Mature cones in the canopy dry and shrink in low humidity, opening up their scales to expose the seeds, which are easily dislodged by the wind. A typical sequoia cone is about 2.5 inches long and contains about 200 tiny seeds, each the size and shape of a flake of oatmeal. A single large sequoia may produce 400,000 seeds in a year, but only a very small percentage germinate. 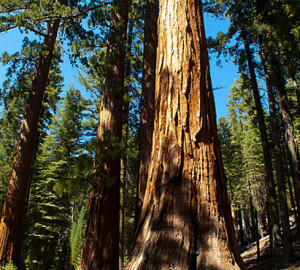 Giant sequoias grow so large because they live a very long time and grow quickly. Hormones regulate the growth of trees. One such hormone (called auxin) is produced at the growing tip of the treetop. Auxin prevents branch growth at the top of the tree to make sure that the mid-crown branches get enough sunlight to survive. If it weren’t for auxin, redwood trees would be round and would not be nearly as tall. Sun filters through the Cathedral-like coast redwood forest of Jedediah Smith Redwoods State Park. Photo by Stephen Sillett. Endangered marbled murrelets nest only in old cone-bearing trees with branches large enough to prevent the single egg laid from rolling off. The chick sits on the branch for about a month after it hatches and then flies westward to start its own adult life on the sea. More than 75% of all California’s marbled murrelets nest in the old forests of Redwood National and State Parks. Zoe Lindo and Jonathan Whiteley at McGill University found cyanobacteria in mosses growing in the redwood canopy. These bacteria take nitrogen gas out of the atmosphere and convert it into nitrogen compounds that plants need to grow. Before this study, it was thought that this natural fertilization in moss mats only happened on the forest floor. 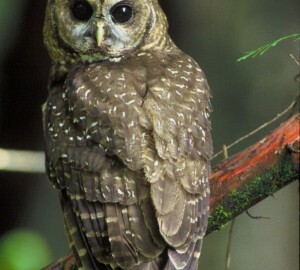 The imperiled northern spotted owl depends on habitats including old-growth redwood forests, partly because it nests in tree cavities and on large branches. The spotted owl is another irreplaceable redwoods inhabitant. Photo courtesy of the U.S. Fish and Wildlife Service. The canopy, the uppermost level of the forest, is formed by the crowns of the biggest trees. Because its canopy is so thick, sunlight does not always reach the coast redwood forest floor. To protect themselves, redwood leaves secrete waxes arranged in a complex layer. This layer limits water loss and allows carbon dioxide to enter the leaf for photosynthesis. Autumn is when the oldest, most shaded redwood leaves die from old age. Even though redwoods are evergreen, meaning they keep green leaves on their crown year-round, they still need to shed the oldest leaves that cost the tree too much to support since they no longer do photosynthesis efficiently. These leaves are usually the orange ones on the underside of redwood branches. Coast redwood boasting colorful fall leaves at Humboldt Redwoods State Park in August. Redwoods can grow well in range of conditions because their genetic code gives them the flexibility to build many forms of leaves on the same tree. Leaves at the tree top are tiny in comparison to the leaves growing at the bottom of the tree. This is because the leaves at the bottom are in the shade and need more surface area to absorb light. Soil can be found high in the branches of coast redwood trees. This soil comes from the huge quantity of leaves that the tree sheds each year, some of which collect at the base of large branches and decompose into soil. In studying these soil mats, scientists have found an astonishing number of plants and animals, including beetles, crickets, earthworms, millipedes, salamanders, various fungi, ferns and even young trees—all living hundreds of feet in the air. If you look at a giant sequoia cone with the bottom end facing you, you will notice that the scales form spirals. This is the Fibonacci sequence found everywhere in nature: in the spiral of snail shells and in the shape of storms and breaking waves, for example. Rhododendron macrophyllum means “rose tree with big leaves.” This shrub grows in the understory from Santa Cruz up to Del Norte and begins blooming in May. As summer approaches, this shrub will begin relying heavily on fog water. Todd Dawson, one of our lead RCCI scientists, found that up to 45% of the water this species depends on during the summer comes from fog (rather than residual rain water in the soil). 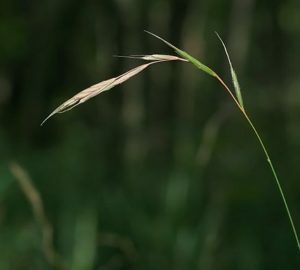 Slender false brome, a bunch grass, has spread from Northern Africa, gaining its first stronghold in California. Now in the Woodside area, it is quickly spreading by seed on the forest floor under the redwoods. If it continues to spread, this species may compete with our native plants. The hardy leaves of sword fern (Polystichum munitum) are most vulnerable in the spring when they are brand new. Fern fronds emerge as fiddleheads covered in tough scales that protect the delicate leaf as it grows. As the leaf uncurls, it is vulnerable to being eaten by insects like caterpillars that munch away on the young sword fern fronds. Caterpillars can hide in curled up frond tips and their munching causes fern fronds to be deformed as they develop. 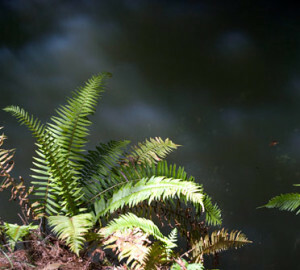 Some sword ferns grow right along creek edge to get maximum water and sunlight. 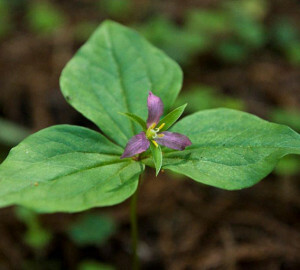 Trillium, a beautiful plant that grows underfoot among the redwoods and in other North American forests, makes seeds that are covered in a fleshy wrapper (called an elaiosome). Usually, trillium seeds are dispersed throughout the forest by ants, but yellow jackets move their seeds too. The yellow jackets collect the seeds and eat the elaiosome, but not the seed itself. This means that trillium seeds get airlifted to new parts of the forest by these yellow, winged creatures. Collectively, North American forests sequester 12-18% of the carbon dioxide released during fossil fuel burning in the US every year. All redwood forest plants contribute to this. Our RCCI scientists are learning more about how much carbon dioxide the redwood forest plants use & lose under different climatic conditions. 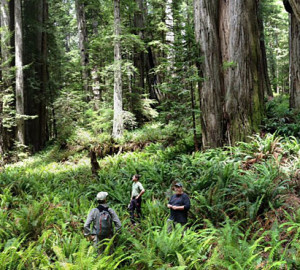 RCCI scientists study the impact of climate change on the redwood forest. Carpeting the coast redwood forest floor are the delicate redwood sorrel with its pink flowers and purple stems, and the sala with its leathery green leaves and blackish-purple summer fruit, as well as a multitude of ferns. Several species of the fern polypody send up new fronds with the first autumn rains. Polypody often grows on the tree trunks of winter deciduous trees, where they get more light during the winter since their tree hosts have dropped their leaves. Light shines on a leather leaf up in the redwood canopy. Ancient forests have many large, standing snags, or dead trees, as well as downed nurse logs that vary in size and are in different stages of decay. These snags and nurse logs provide food and homes for many plants and animals. Rhododendrons and azaleas create a glorious burst of color on the coast redwood forest floor in May and June. The plants and shrubs living on the forest floor must be able to thrive in deep shade, and ancient forests have many shade-loving plants. Western bracken fern (Pteridium aquilinum, meaning “eagle-like”) thrives in many ecosystems around the globe and is a resident of our coast redwood forest. A perennial plant, it survives over winter as a dormant root system. Bracken fern reproduces clonally through soil by expanding lateral rhizomes. Then, in the early spring, new fern fronds poke up into the sunlight as unfurling fiddleheads. 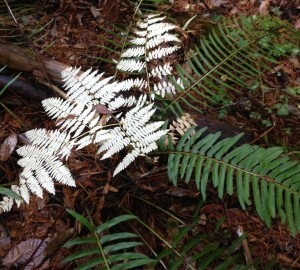 A fading bracken fern leaf glows white against the green leaves of sword fern at Big Basin Redwoods State Park. Redwood forests also support a large number of animal species, including more than 200 different vertebrates. Frogs, salmon, toads, salamanders, snakes, lizards, marbled murrelets, sparrows, blackbirds, wood warblers, bats, squirrels, chipmunks, mice, weasels, bear, deer and elk all can be found among redwoods. 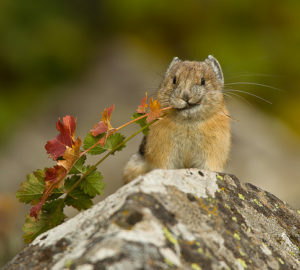 Pikas live near giant sequoia forests in the Sierra Nevada. They don’t hibernate because their high metabolism helps keep them warm in the winter. During the summer, their metabolism puts pikas at risk of overheating. Some animals in the redwood forest dine on a feast prepared by another species. 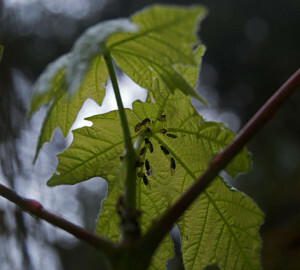 Some ants tend flocks of aphids and dine on the sugary honeydew that aphids excrete after sucking sap from plants. These aphid-tending ants watch over their aphids, protecting the aphids from predators like ladybugs. Because of ant protection, aphid populations grow and ants receive a nearly constant supply of sugar. However, if the ants discover another sugary food source, they will actually begin to eat the aphids in order to increase their protein intake. In fact, some plants produce sugar in special glands call nectaries which encourage ants to consume the aphids that are sucking away the plant’s sugar. The coast redwood forest is home to the largest slug in North America and the second largest slug worldwide. The banana slug (Ariolimax columbianus) grows up to 8 inches long and can live for 7 years. Banana slugs secrete slime to help them crawl, to deter hungry predators, and to keep from drying out. Banana slugs break down plant materials. Primarily in May and June, black bears (Ursus americanus) sense the pulse of carbohydrates flowing down redwoods’ trunks. They strip the bark from redwoods that are 10-20 inches in diameter to eat the sugary cambium, the layer of living cells that produces wood. 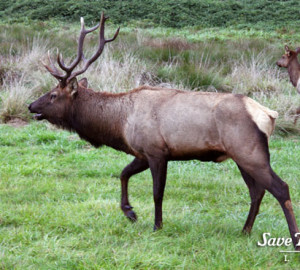 Roosevelt elk live in the meadows of Prairie Creek Redwoods State Park. A large Roosevelt Elk wanders through the Fern Watch plots at Prairie Creek. The rough-skinned newt lives in water and on the coast redwood forest floor. Its skin secretes poison. 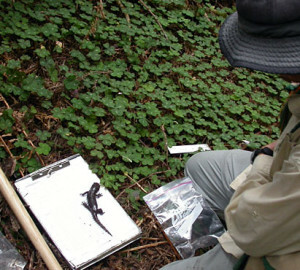 Researchers Garth Hodgson and Hartwell Welsh pay particular attention to tiny amphibians in their League-funded research study. 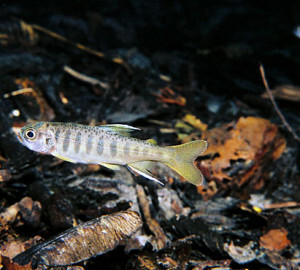 Virtually all redwood forests have (or once had) streams inhabited by salmonids, or fish in the salmon family. 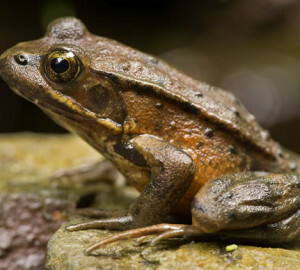 Ancient redwood forests are home to the world’s most primitive frog, the tailed frog, which lives in cold, rocky streams. It can take many hundreds of years for a fallen redwood to fully decompose. 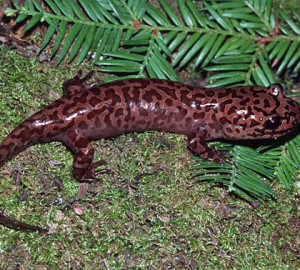 Did You Know This Salamander Rattles? The California giant salamander (Dicamptodon ensatus) is one of only two salamanders in the world that vocalize. This large spotted amphibian lives in the coast redwood forests of primarily Mendocino, Napa, Sonoma and Santa Cruz counties. Meet a fascinating plant of redwood country: Elk clover, also known as California spikenard (Aralia californica), is the only member of the ginseng family that is native to California. It’s a perennial deciduous plant (meaning it sheds its leaves in the fall), and it has really large leaves about the size of a person’s hand. Read more on our Giant Thoughts blog. 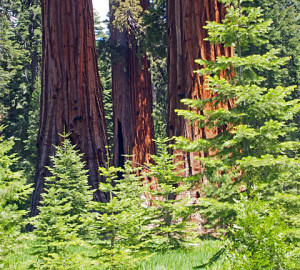 New giant sequoia trees can only grow from seeds. 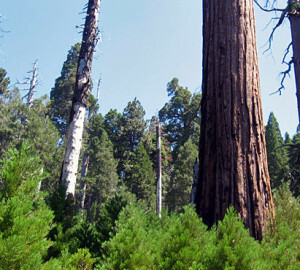 Naturally occurring fires create openings in the forest, allowing young giant sequoias to grow. Fire suppression policies in recent years has increased the growth of a dense, brushy understory and reduced the likelihood of giant sequoia regeneration. 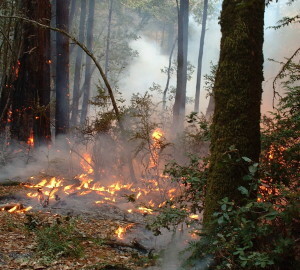 Frequent, naturally occurring fires play an important role in keeping coast redwood ecosystems healthy because they rid the forest floor of combustible materials. Decades of fire suppression practices usually result in the accumulation of dead plant material that may fuel intense, destructive fires. Did you know that many fossilized redwood ancestors exist throughout the Southwestern US? About 34 million years ago, a close relative of the coast redwood and giant sequoia flourished in what is now the high desert of central Colorado. In Florissant, CO, an extremely unique petrified trio of redwood trees was found – the only fossil of a redwood “fairy ring” or family circle ever discovered. These fossils offer a detailed glimpse back in time at a fascinating period in climatic change, when the climate shifted in this region from a warm, subtropical environment to a more temperate and cool climate. Florissant Fossil Beds National Monument. Photo by National Park Service Digital Image Archives [Public domain], via Wikimedia Commons. Poking up through the debris on the Usal forest floor in Mendocino County are rare flowers called “mycotrophs,” named because they depend on fungi for food. Below ground, the roots of these flowering plants connect with mycorrhizal fungi and absorb sugars and nutrients from their fungal partners. 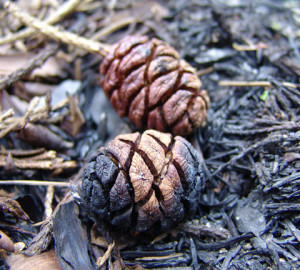 Every year, tiny coast redwood seeds fall to the forest floor from cones produced at the redwood tree tops. Most seeds don’t survive, but occasionally there is enough moisture, room on the forest floor, and light for a seed to grow. If it keeps growing year after year, surviving being stomped by hiker’s boots, fires, storms, droughts and more, it just may become a part of the tall redwood canopy. Black bears live in redwood forests and gnaw on sugary redwood bark. 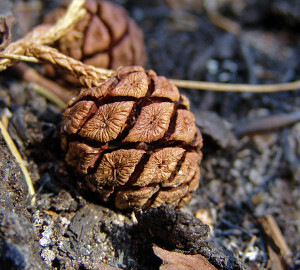 Chickarees (a kind of squirrel) and long-horned beetle larvae help to spread sequoia seeds by eating the fleshy scales of the cones and freeing the seeds. The plants and animals in the redwood forest are interdependent in many ways. Scientists now understand that these complex interactions are crucial to the survival of the ancient redwood forest. Mushrooms appear with wet, wintery weather in the woods, including the redwood forest. Some species’ bright colors are warnings to animals that fungi make toxic chemicals for protection. Rhododendrons, dogwoods and ferns thrive underneath the trees, as do poison oak, huckleberry, hazel and many flowering herbs. 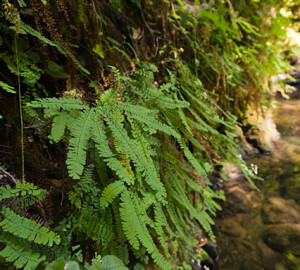 The five-finger fern grows in shady, moist banks or rock crevices among the redwoods. 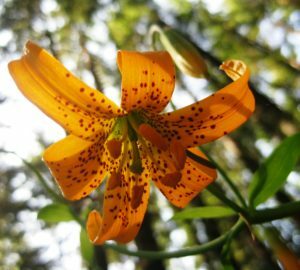 The leopard lily, with its yellow, spotted, turned-back petals, blooms through July in the redwood forest. Lunularia cruciata is a liverwort, one of the world’s small plants. A relative of mosses, this plant hugs the ground as it grows horizontally on moist soil. This liverwort gets its name from the moon-shaped cups on the top of the plant (Lunularia for luna, or moon). These small cups (called gemmae), contain baby liverworts that get bounced out by raindrops and ricocheted to a new patch of ground to hopefully start growing. The pitcher plant (Darlingtonia) is carnivorous and grows along the Smith River just north of Stout Grove of Jedediah Smith Redwoods State Park. Special leaves trap flying insects that are attracted to the scent produced by the plant. Once inside the pitcher, these insects are digested and the nutrients are absorbed by the plant. Pitcher and other carnivorous plants are found in areas where the soil has little nutrients. Darlingtonia Californica. Photo by Dave Berry, flickr. This flashy, red pillar of springtime in the mountains is a mycotroph (one of those funky plants that does not do photosynthesis and so has no reason to be green). It feeds itself by drawing sugars from its pine tree neighbors through an elaborate network of fungi attached both to the snow plant and pine tree roots. 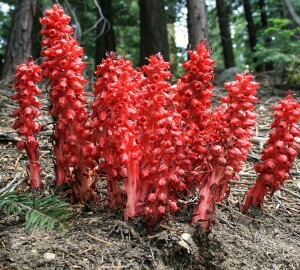 Snow plants pop up at elevations between 4,000-8,000 feet in yellow pine, red fir, and lodgepole forests once the snow melts and they are a stunning symbol of spring and that cannot be missed! 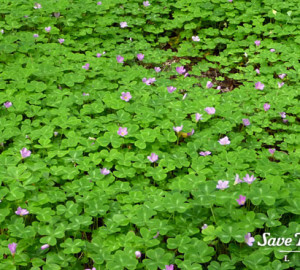 Redwood sorrel often carpets the shady redwood forest floor. Redwood violets bloom from March through June in the moist redwood forest. Fragmentation is one of the biggest threats to today’s remaining ancient redwood forest, which is mostly made up of isolated groves in parks or forestlands. Who’s Behind the Name ‘Humboldt’? Much of the League’s redwood protection work has been done in Humboldt County, especially in Humboldt Redwoods State Park, in which we have secured more than 53,000 acres. The county and park are named after Alexander von Humboldt (1769-1869). Humboldt was a German explorer and naturalist who made major contributions to the study of how the environment works. In California, thousands of acres of ancient coast redwood forest are on private land and could still be logged for lumber or to make room for development. Explore more FAQs about redwoods. Argentine ants have invaded every ecosystem in California except for the redwood forest. Often attracted to human food and shelter, these ants occupy easily many habitats apart from redwoods. It turns out that these ants can’t tolerate the chemicals produced in redwoods leaves called terpenes. Because giant sequoias need well-drained soil, compacting the soil by walking around their shallow roots can seriously damage giant sequoias. Our recent purchase of land helps protect the surrounding Giant Sequoia National Monument (pictured), home of some of the Earth's largest trees. Redwood seeds sprout on a variety of surfaces, ranging from bare soil and leaf litter to rocky ledges. The seeds germinate within a few days or weeks of being shed if the right combination of temperature and moisture are present. 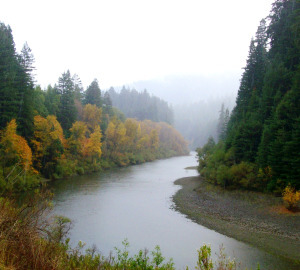 With autumn rains in redwood country, leaves fall into Mendocino County’s Eel River and decompose, releasing carbon, which stains the water dark brown. With more rain, runoff into the river brings sediment from the land. The river turns brilliant blue once sediment flows out of the river or settles to the river bottom. This color occurs because short-wave blue light is scattered, not absorbed like longer wavelengths, by the remaining particulates in the river. Young coast redwoods can sprout from the base of the parent tree, taking advantage of the energy and nutrient reserves contained within the established, shallow root system. 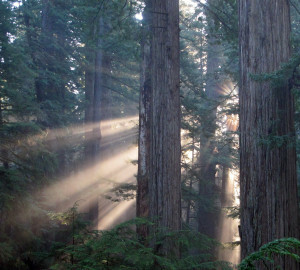 Redwood forests store more carbon per hectare (2.2 acres) than any other forest on Earth. Redwoods store carbon in their trunks. Underground, forest soils and root structures store even more carbon. Water simply moves passively within plants, from wet parts to dry parts. When the soil is wet and the plant needs water to grow, water seeps into plant roots and makes its way by diffusion to dry parts of the plant. But sometimes trees with deep roots absorb water from wet soil deep below ground and this water never makes it up into the tree trunk. If the shallow roots of the tree are laying in dry soil during summer, the water absorbed at depth will leak out of the shallow roots into the surface soil layer that the tree’s neighboring plants are rooted in instead of moving on up into the tree. Scientists call this hydraulic redistribution, or hydraulic lift. Hydraulic lift is one way that plants help each other out in a shared habitat. Unlike animals that have an active circulatory system that pumps blood around the body, in plants such as redwoods, water simply moves passively from wet parts to dry parts. When the soil is wet and the plant needs water to grow, water seeps into plant roots and makes its way to dry parts of the plant. 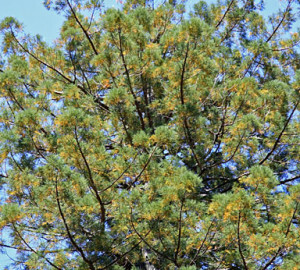 In late summer and fall, redwood growth slows and some trees need less water. This causes water level rise in some small coastal streams because large redwoods nearly stop drawing water from the soil. 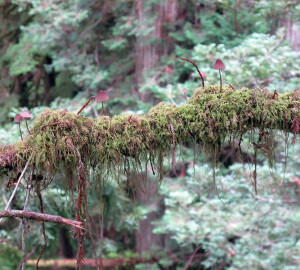 Winter rains cause fungi to reproduce in the redwood forest. Coral fungus emerges from the redwood forest floor after rains and displays white, yellow, orange and red mushrooms. It grows quickly because it gets sugar energy directly from the trees in the forest. As climate changes, we may see large shifts in the snowpack each winter. Researchers studying when snow begins to melt in the Sierra have observed that peak snowmelt is occurring 0.6 days earlier every decade in California, according to the study by Sarah Kapnick and Alex Hall, “Observed Climate-Snowpack Relationships in California and Their Implications for the Future,” published in the December 11, 2009, Journal of Climate. This means that snow begins supplying water to the streams and river systems earlier than before and drains the Sierra of water earlier in the season. 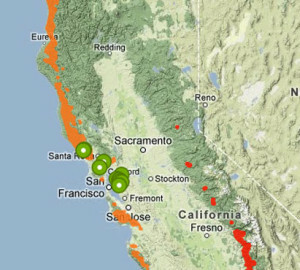 So far, this acceleration has only sped up snowmelt by a few days over the past century, but temperatures are predicted to increase in California by 2-7°C by the year 2100, according to the study by Katharine Hayhoe and colleagues, “Emissions Pathways, Climate Change, and Impacts on California,” published in the Proceedings of the National Academy of Sciences in 2004. This extreme warming is projected to cause earlier snowmelt by 6-21 days, according to Kapnick, and reduce the total snowpack by 30% at best and up to 90% at worst this century, according to Hayhoe. The scientists of the Save the Redwoods League Redwoods and Climate Change Initiative are working to gain the critical data necessary to develop strategies for helping redwoods adapt to such rapid environmental changes. Possible ways the Initiative findings could help redwoods survive in the future include protecting cooler and moister habitats so the trees will have a place to grow if their current range becomes too warm or dry. 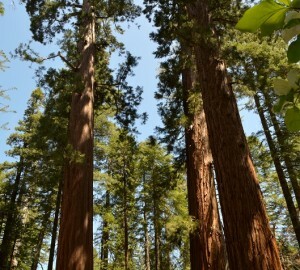 Nearly snowless giant sequoias at Sequoia National Park in March. The largest surviving stands of ancient coast redwoods are in Humboldt Redwoods State Park, Redwood National and State Parks, and Big Basin Redwoods State Park. California has two state trees: the coast redwood and the giant sequoia. On April 3, 1937, a senate bill named “the California redwood” as the state’s official tree. In 1953, the original law was amended to officially recognize both the coast redwood and the giant sequoia as the state trees. The coast redwoods in their southern range differ genetically from those in the trees’ northern range. Research studies show that the Sonoma-Mendocino County border separates two populations of redwoods, one population that extends south to Big Sur and one that extends north to the Oregon border. 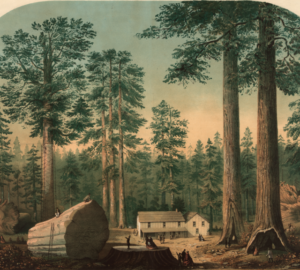 When gold was discovered in 1849, hundreds of thousands of people came to California, and redwoods were logged extensively to satisfy their housing needs. By the 1960s, only a small fraction of the original 2 million acres of ancient coast redwood forest remained. While mature giant sequoia trees themselves are too brittle to produce useful lumber, real-estate development near the groves threatens the ecosystem on which they depend. As houses and towns are built closer to giant sequoia groves, the amount of water available to the trees often significantly decreases. 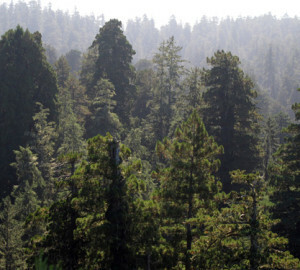 In addition, smog from nearby cities can harm the ecosystems in which giant sequoias live. Learn more about the threats to the redwoods. Some of the largest surviving giant sequoia groves may be seen in Sequoia and Kings Canyon National Parks, Giant Sequoia National Monument, Calaveras Big Trees State Park and Yosemite National Park. The northernmost grove of giant sequoia, containing only six trees, lies near the middle fork of the American River in Tahoe National Forest. The first botanical name for the giant sequoia was bestowed in Britain. It was called Wellingtonia gigantea after the Duke of Wellington. Americans retaliated with the name Washingtonia gigantea, but that name had already been given to a genus of palms. Botanists settled the matter, giving the giant sequoia its own genus, Sequoiadendron giganteum. Redwoods get their common name from their bark and heartwood, the reddish-brown color of which stems from high tannin levels. Most of the first efforts to save redwoods were directed towards giant sequoias, which had become known as individuals — the Discovery Tree, the Mother of the Forest, and others. By contrast, the coast redwood forest seemed so huge, dark, and forbidding that few people thought of protecting it. The mammoth trees (Sequoia gigantea), California (Calaveras County) / executed in oil colors by Middleton, Strobridge & Co., Cin. O.
Redwoods have more chromosomes than most other cone-bearing trees, a fact that also may help them grow tall. Chromosomes are the part of the cell that carries genes. Conifers usually have 20 to 24 chromosomes, but redwoods have 66 or more. That is because redwoods have six copies of each chromosome, while most conifers have two copies of each. A coast redwood stands tall in the forest at Prairie Creek Redwoods State Park. Photo by Mario Vaden. 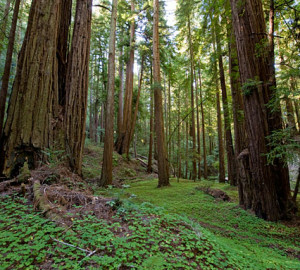 Redwood forests as we know them today have been present in California for about 20 million years. Ancestral redwoods once grew throughout the northern hemisphere. 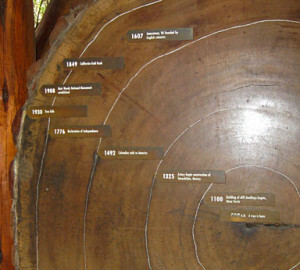 Visitors to Muir Woods can see the dates of redwood tree rings.Visitors to Muir Woods can see the dates of redwood tree rings. Since 1993, the US Northwest Forest Plan has reduced forest harvesting on public lands by 82%. Originally intended to save habitat for endangered species such as the northern spotted owl, this plan had unexpected consequences. In a new study, researchers from Oregon State University and the Pacific Northwest Research Station show that this conservation action had the unanticipated benefit of greatly increasing carbon sequestration throughout the mixed coniferous forests of Washington, Oregon and California. Restricting timber harvesting in public forests helped reduce greenhouse gases in the atmosphere, a critical step toward reducing global warming. The giant sequoia is known as the Big Tree or sometimes called Sierra redwoods. The Earth’s last giant sequoias total fewer than 48,000 acres distributed in 77 scattered groves along the western slopes of the Sierra Nevada mountains. More than 90 percent of giant sequoia acreage is in public ownership. The coast redwood is often called the Tall Tree. 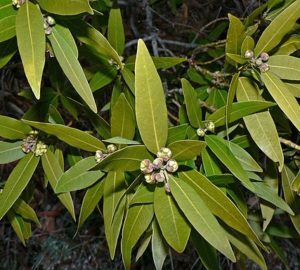 The California bay laurel is native to the redwoods region. This tree can be found in mixed hardwood forests as well as in the understory of coniferous and redwood forests. 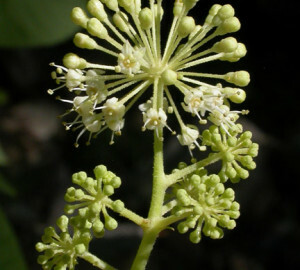 It has a very symmetrical shape to its crown, and is densely leafed with long, oval-shaped leaves. The fruit somewhat resembles olives, but is not very edible. Historically, European settlers and Native Americans both used the leaves from this tree for treating headaches and rheumatism. Native Americans also used the root bark to make a healing tea, and used the leaves for insect repellent. During the Great Depression, the town of North Bend, Oregon, even used this tree to mint their own currency! Many other tree species can live among the coast redwoods, including Douglas-firs, western hemlocks, grand firs, Sitka spruces, tanoaks, madrones, maples and California bays. After losing as much as 95 percent of their foliage from fire, giant sequoias can continue to live and grow for centuries. Redwood bark resists fire because it contains only traces of resins and volatile oils. The bark holds large quantities of water, which protects them from periodic, naturally occurring fires. It is also thick, so even if part of the bark burns, the tree is most often still protected. Fire-suppressed sequoia grove – note the large fire scar on the giant sequoia on the right. Sequoia National Park‘s General Sherman Tree, a giant sequoia, is about 52,500 cubic feet, roughly equivalent to 21,800 150-pound humans! The Sierra forests are less dense than the coastal redwood forests, and giant sequoias with their bright red bark can be seen from a great distance. Giant sequoias in Mariposa Grove, Yosemite. The oldest known coast redwood tree was 2,200 years old. Counting growth rings in the trunk can indicate the age of a tree. 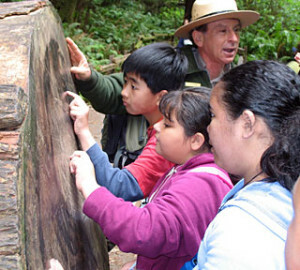 In April 2016, the League installed an interpretive panel explaining redwood forest plants, animals and tree rings and welcoming visitors to the Pfeiffer Falls Trail. 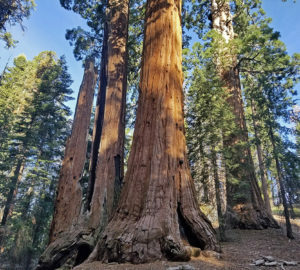 Scientists believe that many of the largest living giant sequoias are between 2,000 and 3,000 years old; the oldest recorded specimen exceeded 3,500 years. Counting growth rings in the trunk can indicate the age of a tree. Trees only grow taller at the top. At the base of the tree, the only growth is out. As the tree makes more wood, the bark gets pushed out and the oldest bark flakes off. The most common lichen on coast redwood bark is Leproloma membranacea, which makes the lower parts of the tree turn green in color. California’s giant sequoia is the world’s most massive tree and one of the oldest. Giant sequoias have trunks up to 30 feet around near the ground and grow up to 310 feet tall. 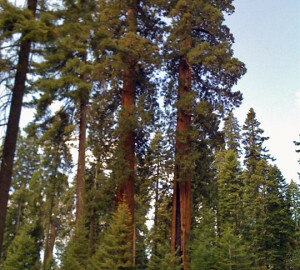 Giant sequoias are some of the world's largest trees. Chemicals found in the leaves, branches and bark of redwoods give these trees a remarkable resistance to fungal disease and insect infestation. Ancient coast redwood forests contain the highest standing biomass (total of all above-ground organic matter) of any forest on Earth, and therefore store incredible amounts of carbon in tree trunks and forest soil. More than just tall trees, a redwood forest is a complex ecosystem made up of an astounding variety of living and once-living things. The coast redwood’s tall trunk has no branches or leaves near the base of the tree, making fire unlikely to spread to the tree top. If a fire does burn the tree, it can sprout a new trunk from the base. Strong coastal winds are believed to have shaped the unusual trees at our Shady Dell property. Wind breaks off branches and makes plants lose water fast from their leaves. If wind blows consistently from the same direction, it will shape trees. Stellar’s jays live among redwoods, often scavenging near people. 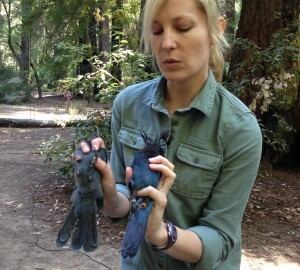 Research Elena West, explains how the juvenile Steller's jay (left) has grayer feathers relative to the adult jay (right). Did you know that organic chemicals released by coniferous trees can influence climate? These chemicals, called terpenes, give coniferous trees their distinctive, and often pungent, fragrance. Studies show that they also have effects upon the climate as well. Terpenes react with molecules in the air to form aerosols. As the aerosol gas molecules rise through the atmosphere, they interact with water vapor and help the vapor condense into clouds above forests. The formation of these clouds causes sunlight to be reflected away from the earth’s surface and lowering temperatures. The giant sequoia ecosystem includes other trees such as sugar pines, ponderosa pines, and incense cedars as well as wildflowers and other plants living in the shade of the big trees. Heartwood at the center of trees, including redwoods, is primarily used for storage. Only the newest wood (called “sapwood“) near the outside of the tree is used to transport water up to the treetops. Redwoods create their own “rain” by capturing fog on their lofty branches, contributing moisture to the forest in the driest time of year. Scientists recently took a look back at the history of fire in pine forests of the Southwestern US and discovered that the devastating megafires of recent decades are unprecedented. 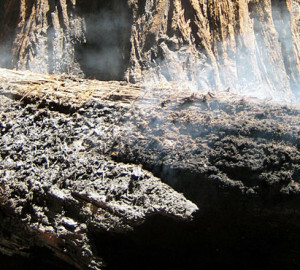 By searching for fire scars etched into the wood of ancient trees, they discovered that historic fires burned more frequently and were less intense. Today, fires burn hotter, spread more easily, and scorch the canopy which kills trees. These super fires devastate the landscape more than historic fires because the forest structure is now different after two centuries of logging, grazing, and other human activities including fire suppression. Young forests today are often overcrowded with trees and this allows flames to leap skyward into the treetops and spread quickly over the landscape. Today, the Sierra snowpack is at near-record levels above the historic normal range. 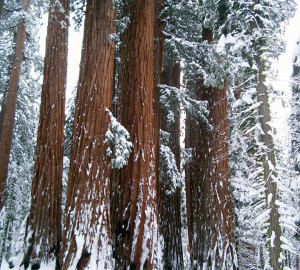 This is good news for giant sequoias that depend on snowmelt for water. But scientists predict the changing climate will reduce the snowpack significantly. Learn about predicted reductions in the Sierra snowpack. About 20 million years ago, the giant sequoia’s direct ancestors lived in what is now southern Idaho and western Nevada. As the Earth’s plates moved and the Sierra Nevada slowly rose, the climate east of the mountains gradually became much drier and hotter in summer and colder in winter. Sequoias, which prefer more moderate conditions, migrated westward to where California is now. About a million years ago, advancing ice sheets confined the coast redwoods to their modern range. 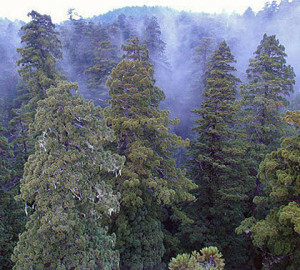 The glaciers left untouched a well-defined area, now known as the redwood belt, where tall trees flourished undisturbed. Coast redwoods grow naturally today only in a narrow 450-mile strip along the Pacific coast from central California to southern Oregon. About a million years ago, glaciation restricted the giant sequoia to the middle elevation ridges of the Sierra Nevada. Now, giant sequoias grow naturally only on the western slopes of the Sierra Nevada mountains of California. 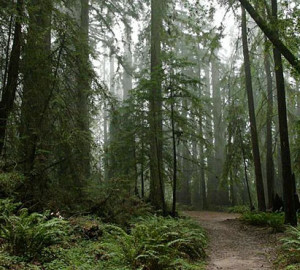 Heavy winter rains and dense summer fog in the “redwood belt” provide coast redwoods with much-needed water during the otherwise drought-prone summers. The League knows that past climate change was a serious danger to coast redwoods. Many scientists are concerned that rising temperatures and changing weather patterns will reduce the coastal fog on which redwoods depend and may further limit the range of redwood forests. 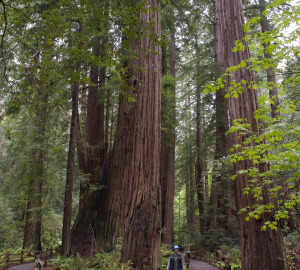 Trees continue to grow as long as they live – and coast redwoods can live more than 2,000 years. In addition, these trees live where the soil is very rich in nutrients, where they are protected from winds and where they receive lots of winter rain and summer fog. These conditions allow them to thrive and grow to great heights. 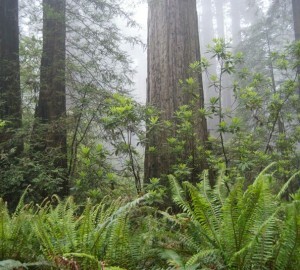 Photo caption: Coast redwoods, surrounded by fog, grow tall in Redwood National Park. Photo by Paolo Vescia. 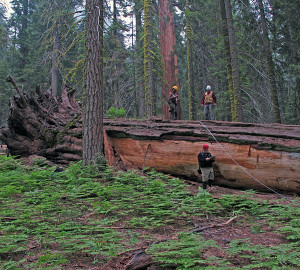 Thomas Swetnam and colleagues did an analysis at Giant Forest, a magnificent giant sequoia ecosystem in Sequoia National Park, in 2009. They counted and dated fire scars in 52 giant sequoia trees and measured charcoal deposits in local meadows They found that fire frequency was highest between 800-1300 C.E. (Common Era), a warm dry period of recent climate history known as the Medieval Warm Period. High air temperature and low water availability during this historical drought may reveal what may happen again with intensified drought due to contemporary climate change. Climate change will require more careful land management if the fire frequency does in fact increase this century. Sequoias are sensitive to temperature and cannot live if it gets too hot or too cold. In the 260-mile stretch of the Sierra Nevada that lies between 5,000 feet and 7,000 feet in elevation, there is generally enough snowfall to provide the moisture the giant sequoias need, without being too warm or cold. The League knows that past climate change was a serious danger to giant sequoias. Many scientists are concerned that rising temperatures and changing weather patterns will reduce the annual snowpack on which sequoias depend. The changes also may cause the Sierra snowpack to melt earlier in the spring, lengthening the dry season. To thrive, giant sequoias require thousands of gallons of water each day. They benefit from the Sierra snowpack that accumulates over the winter months and get some of the water they need from snowmelt that soaks into the ground. A typical giant sequoia grove. Redwoods use fog in many ways. First, trees need less water in the soil when it is foggy because they lose less water from their leaves. Second, the trees absorb the fog directly through their leaves, which is an especially important source of water during the dry, rainless summer. Finally, the condensed fog drips to the ground below the trees, where it soaks into the soil for later use. 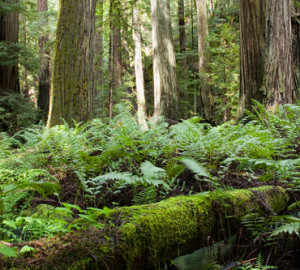 How we use land surrounding the redwood ecosystem impacts the climate of redwood forests. 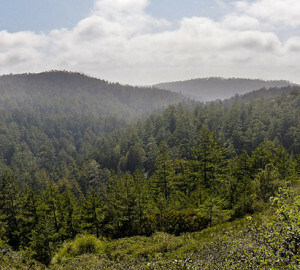 Logging and poorly planned development can threaten nearby redwood forest areas. These threats may cause erosion, increased air temperatures and other environmental problems that can damage the ancient trees and other forest inhabitants. Our outdoor office view when tracking climate change impacts on coast redwood forest ferns for Fern Watch. In the “redwood belt” temperatures are moderate year-round. The climate is Mediterranean with cold, wet winters and warm, dry summers. 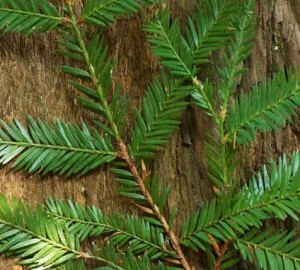 The redwood genome is complex. 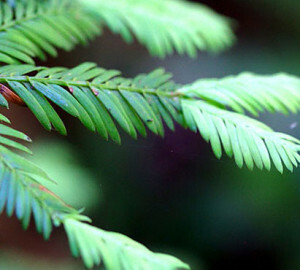 Humans have only 2 sets of chromosomes in our genome, but the coast redwood actually has 6 sets of chromosomes. This makes it more difficult to compare the genomes of different redwoods and study relatedness among trees, but new methods are helping scientists crack the redwood genetic mystery. Why does this matter? If there were few genetic differences among the redwood trees in the whole ecosystem, climate change or disease would likely impact all the trees in the same way. Since there are two populations, each population will likely respond to the future differently. Our Redwoods and Climate Change Initiative science team is studying the physiology and growth of the trees in both populations, stay tuned! Some of the bats living in the coast redwood forest can be found among the redwoods all year long. One such species is Yuma myotis (scientific name Myotis yumanensis). It eats insects when they are plentiful in the forest during the spring and summer, and it hibernates during winter when insect food is less plentiful. Many species of forest birds worldwide need holes in trees for shelter and nesting. Woodpeckers help other birds survive by pecking cavities in which they can nest. Amazingly, up to 77% of tree cavities used by birds for nesting in many parts of North America are made by woodpeckers! One of the League’s held properties is the site of a single spectacular tree. The Bennett Tree, a western juniper tree (Juniperus occidentalis var. 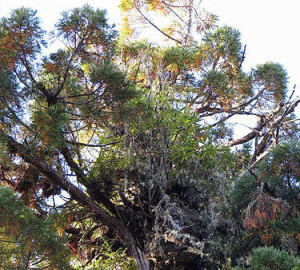 australis), is possibly the oldest documented living tree. Scientists have estimated its age from growth rings, measuring its age somewhere between 3,000 and 6,000 years old. Additionally, this individual is also the largest known juniper tree in the world, standing at 86 feet tall with an average diameter of 13 feet. At breast height, the tree measures 40 feet around! Bennett Juniper is quite large! Our property caretaker is standing to the right of the tree.